This is an explanation of the security that was added in TA88v3, and which will be likely in PSP3000. When the PSP boots, the boot code (aka pre-ipl or ipl loader) loads the ipl from either the nand or memory stick. The IPL is splitted into pieces of 0x1000 bytes. The security of kirk hashes was destroyed by a timing attack, and the IPL became unprotected. What has Sony added to fix this? The answer can be found in 4.00+ slim ipl’s. They decreased the size of the ciphered body to 0xF40 to leave 0x20 bytes at the end of each block (at offset 0xFE0). As stated before, these remaining bytes are ignored… in pre-ipl’s of psp’s prior to TA88v3, and in fact, they can be randomized and ipl will still boot in those psp’s. In newest pre-ipl’s, these 0x20 bytes have a meaning. The second 0x10 bytes seem also to be dependent of the decrypted body (maybe dependent of the previous 0x10 bytes too?). In the picture it can be seen that they are different in 4.01 and 4.05, but they can actually be interchanged, you can move those 0x10 bytes from the same block in 4.05 ipl to the 4.01 ipl and it will still boot; however it cannot be randomized. This protection also destroys any possibility of downgrading below 4.00, as these new cpu’s won’t be able to boot previous firmwares ipl’s. 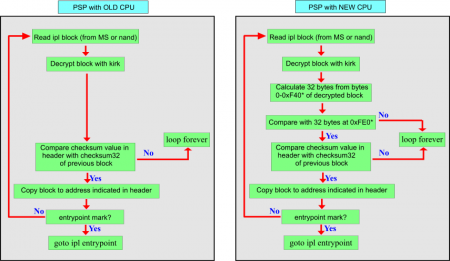 Summary: basically, all security of newest psp cpu’s rely on the secrecy of the calculation of those 0x20 bytes. If pre-ipl were dumped somehow, the security would go down TOTALLY.